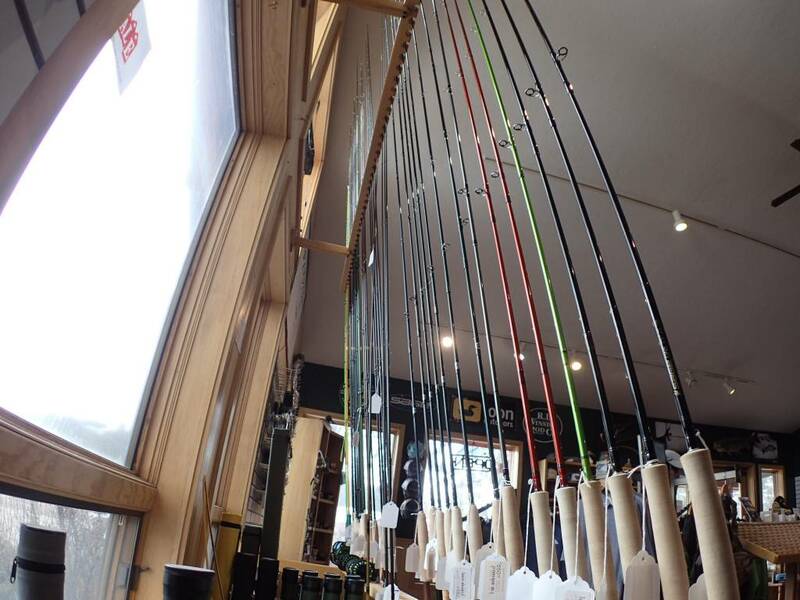 Buying a fly rod? The right size rod for SW Montana. Fishing in SW Montana? What's the ideal size rod? Read on to find out. This article originally appeared in Explore Big Sky. Mid-March means glory season here in Big Sky—bluebird days on the ski hill and the potential for dry flies on your favorite local trout river. And I’ve been out enjoying both, which is why several emails from my editor inquiring to the whereabouts of this column and its passed deadline went unanswered. In my defense, on chairlift rides and in between drifts of my dry fly, I was brainstorming ideas for this piece. Coming up with a fresh column idea was a challenge, because picking out powdery lines and tasty trout lies also required my attention. But as I was departing the river recently, and thinking of my next stop to end another perfect day—soaking my skied-out and waded-out legs in my hot tub—I realized I’ve covered many topics in The Eddy Line, but lacking was trusted advice on the ideal fly-fishing rod to go with living in our outdoor recreation heaven. Here’s my take on the best all-around fly-fishing rod for our local waters. Choose a five weight. Fly rods are classified by weight: zero weights on up to 14 weights. The lower the rod weight the lighter and less burly the rod. Most rods for trout fall into the zero to seven-weight category, with four to six weights being the preferred choice. Eight- to 10-weight rods and up are for larger waters, cast large flies with ease, and handle beefier species of fish such as bass, bonefish, steelhead and permit. Eleven-weight rods and up are for big-time fish and the larger flies often required to catch them. I’ll be taking my 12-weight rod to the Providence Atoll in the Seychelles in April, because a five weight and a giant trevally do not mix well. But until then, my five weight is my go-to rod for our local waters. Four- and six-weight rods are OK, but they can be under-gunned or over-matched. I’m talking about one rod to do it all—the true workhorse rod for our local waters. A four-weight rod can cast single dry fly mayflies on the Gallatin well and might be first choice to do so, but if the oh-so-frequent down-canyon southerly wind kicks up, turning over a 12-foot 5X leader with a four weight is tough. If the fish cease their surface feeding, and you have to fish weighted nymphs or streamers, fishing a four weight shifts from fun to work. A six weight is a good choice for a double-nymph rig or for dragging streamers; however, if the wind calms, flies hatch, and it’s time to fish single dries to rising trout, a six weight is like trying to park a Suburban in Manhattan. It can happen, but it’s never as easy as you think. Be fine with nine. Rods come in many lengths, from 7 to 12 feet. For our local waters, a 9-foot long five weight is the rod of choice. This length allows for maximum mending efficiency and if you spend anytime floating rivers and fishing, a 9-foot rod is ideal. In fly-fishing nomenclature, we say a 9-foot five-weight fly rod. This length is also versatile because fishing double-nymph rigs or streamers is less of a chore than when fishing shorter rods. Longer rods offer less sensitivity for smaller waters or situations where small flies and light tippets are necessary, such as a spring creek or in late summer when clear and low water conditions are the norm. A medium, or medium-fast action rod is the best choice for most anglers. The action of a rod is described as how it flexes when cast or when a fish is hooked. Slow-action rods may struggle in heavy wind or be outmatched for double nymph rigs. Rods that are too fast or too stiff can make casting cumbersome. Pick a rod with a medium or medium-fast action because they offer the widest range of casting ease and fish sensitivity. Casting range is important if you’re learning to cast or if you ever want to pass on the rod to someone new to fly fishing. Sensitivity is crucial to protect light tippets, the ability to feel the entire flex of the rod while mending, and to more efficiently fight fish quickly. It’s a good thing March is 31 days long, because the clock is ticking on our ability to enjoy two passions in the same day. By reaching for your 9-foot five weight, you’re making a wise decision. You’ve already chosen the perfect place to recreate, now enjoy it more with the perfect rod. Pat Straub is a 20-year veteran guide on Montana’s waters and has fished the world over. He’s the co-founder of the Montana Fishing Guide School, and the author of six books, including “The Frugal Fly Fisher,” “Montana On The Fly,” and “Everything You Always Wanted to Know About Fly Fishing.” He and his wife own Gallatin River Guides in Big Sky.